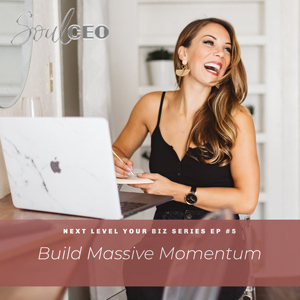 Now that you’ve got all the tips and insight from the past four episodes, I’m wrapping up this series with my business expertise and knowledge on how you can build massive amounts of momentum to get your business to levels you’ve never even imagined! Everything I’ve shared so far on this series is things you can implement into your life every single day to get your business to new levels of growth. I’ll admit though, it’s not always easy. What I’m covering today is all about doing the hard things, the things that make you feel like you’re jumping off a cliff, and it’s scary. Join me on the last episode of the Next Level Your Biz series to reach new levels of growth in your life and business. Your next level up is just around the corner, and I’m going to help you get there by showing you the tools to do just that. What to consider when envisioning your next level of growth. The 3-step process of building massive momentum. Why I still feel like I’m jumping off a cliff every time I take action on scary things. Why I had to start turning down one-on-one clients. A simple way to start creating massive momentum. Hello, how are you guys? I’m so excited. It is number five, episode number five of the Next Level Your Biz series on my podcast, which means it is the final day. I’m kind of sad, but I’m also super excited because I want to celebrate you for being here. I want to celebrate you for showing up and going all the way in, and I want to celebrate you for implementing these things and doing the work. And these are things that you can implement every single week, every single day. So I’m just so excited to see what comes of your business, I’m so excited for all the ladies who have joined the next level mastermind and just to jump in and dig in with them. And I am just so freaking excited. So today, what I wanted to talk about was building massive momentum in your business. And something that I realize when it comes to growing to new levels and continuously stepping into new levels is that a lot of the same lessons and opportunities to grow show up at different levels. They look different. So I’ll just give you guys a really simple example. When I first hired a coach, the investment was a really big stretch, and then it got really comfortable and I grew and I just had all this massive transformation and then to get to the next level, I had to wrap my mind around another investment. For me, that was about money. For some of you guys it might be money, it might be time, it might be energy, it might be doing something you’re afraid of at the next level. Just know that it’s all these different things, this is just an example. But I had to wrap my mind and grow at the next level for a new investment because I was ready to get more time with my coach, I was ready to do this, but it was uncomfortable. And what happens is we get through one level of growth and then we have another level, and it seems like we’ve figured it out at the first level so it feels like we have it figured out now. But what you realize and what I realize with so many people is that we have mind drama at that next level, and sometimes it’s even hard to see because it feels logical, it feels like we understand more. It’s almost like we’re more dangerous because we feel like we understand these levels a little bit better. But the reality is that you are being guided to the next level of growth and it’s going to be uncomfortable. And so that was kind of that – I made that first investment, I made that second investment, and over time I’ve had to elevate at each level and it gets really uncomfortable. Now it looks a little bit different. I still invest huge amounts of money in coaching and that still gets uncomfortable sometimes, but I also make investments other places and I also have to take leaps in other places. So the thing that I really want to teach you guys today is how to build massive momentum in your life and business. And I don’t tell this story for no reason at all. I tell this story because your next level of growth is hidden behind your next uncomfortable decision. So I always talk about this, but your decision-making process creates your current reality no matter where you are, which means that to get to another level, you have to make decisions from a different level, which means getting uncomfortable. Period. I’m all about making this easy. It can be easy, and the less that you allow the resistance the better. But if you want to stretch your mind, if you want to stretch your growth, if you want to create next level results, there’s going to be discomfort because your mind hasn’t wrapped itself around this new level of decision-making. And so something that I noticed, and I actually wrote an email about this the other day is that we get comfortable at our new level. We get comfortable, we grow, we get comfortable with where we are, and we still feel like we’re growing and we’re stretching and all of these things, but at the next level, there’s a decision that needs to be made that’s uncomfortable and we avoid it and we stay comfortable. And so something that I’ve noticed about the most successful people that I’ve been around and about myself that has helped me continue to reach new levels of success is identifying what would I be doing at the next level that I’m not doing now. And why am I not doing it now? Identifying that and actually working my mind around it. So, this episode might be a little bit shorter today because I mean, this is simple, straight to the point, and I just want to leave you guys with some just insane information and just let you go off and run and take this into action. But I want to know, when you envision your next level of growth in business, what things does that version of you do consistently? And really dig deep. Come up with as many ideas as possible. Does she do Facebook Lives? Does she get on stages? Does she have a coach at the next level? Does she hire someone to do her website? Does she hire an assistant? Does she move? What is she doing at the next level? And look at the fear that you have around it now and identify that. So what is she doing at the next level, and then I want you to write down all of the fears that you experience when you think about doing those things now. Now, the difference between you have those next level results and where you are now is the difference between your thinking around those fears. And it’s okay that they feel afraid. This is how you grow, this is how you stretch, this is how you step into another level. Now, the last piece of this is what would you have to believe and think in order to take action on these fears? That they would pay off? That you would get the result? That you are going to learn something and then grow in the process? That you are going to make your investment back times 10? I love that. I have this belief like, any investment I make, I make back times 10. And it’s really powerful and it’s something that I’ve learned and I didn’t always trust that, but it came from taking steps like this. It came from taking actions like that. It came from identifying what I was afraid of at the next level and doing it anyway. So that’s really the three-step process of building this massive momentum. I know it sounds simple but what are the things you’d be doing at the next level, why aren’t you doing them now, and then creating new thinking and new beliefs around the things, around the fears that are keeping you from doing it, and getting into action on those things. It’s the only way and it really is, I’ve seen it time and time again, it feels like you’re jumping off a cliff every time. It feels like for me, in certain things at my level, even money wise, even all of the things, I feel like I’m jumping off a cliff, I feel like I’m letting go of what’s comfortable to jump into what’s uncomfortable, and I have to learn to build trust and belief on the way down. And if you do that, if you can identify what’s the thing – and I’m not just talking about being reckless and doing things like just because. I mean doing the thing you know in your heart you really want to do, even though it’s uncomfortable, even though you’re afraid. Doing the thing, if you trusted that you would get the result you would do, and doing that over and over and over again. Jumping off the cliff. There was a point this past year that I had to turn down clients, which felt very foreign to me because my whole, I want to help people and I only knew how to build a business around one-on-one clients, and I held onto it for a while. And then I realized that if I knew I was going to create the result I wanted in my business, which was more impact, I wanted to impact more people and I didn’t have the leverage or time to do that because I was on so many one-on-one calls, I had to start saying no. And it felt like I was missing out on an opportunity, and it felt like I was jumping off a cliff, but I knew it was the decision I needed to make to create time and space to create the opportunity for me to create the programs that I have today and the leverage that I have today. So I really want you guys to think about what are those decisions, what are those uncomfortable decisions that you’re avoiding that are really the opportunities in the right direction to create your next level? I want you to know, keep jumping every time. That’s how you build insane massive momentum. That’s how you will continue to grow to the new level over and over and over again. You’ll have times where you avoid it and you plateau and you stay stuck and you get comfortable, but just know that the growth is in the discomfort. The growth is in actually committing and making the uncomfortable decision. That is where everything changes and that is what has changed my life in business, that is what I have seen create massive momentum in my clients’ businesses and I know that’s what’s going to change your life. So what I want you guys to do to walk away with, and you will also get a worksheet on this, but I want you to identify what are the next two or three things that would make you super uncomfortable, that you feel like, oh my god, there’s no way, I’m not sure I can even do that, I don’t know if I can afford that, I don’t know if I could take that jump, I don’t know if I can get on stage in front of all those people, and I want you to create a space where you commit to it. Book the event space, put the deposit down. Hire the coach. Say yes, pay the payment right away when you’re in excitement. When you have to say no to opportunities, say no in order to say yes to the next level of growth. And again, it’s always being guided from a place, is it coming from fear, is it coming from love and abundance. Would you be doing this thing if you already had the result that you wanted or would you not be, and are you doing it from a lack place? That is what’s going to allow you to explode. And I really think if you did one thing like that every week, oh my gosh, your business would blow up. So if you can commit to that, you’re going to change the game on what’s possible for you. You’re going to change the game on what’s possible for your life and your business and you’re going to keep growing and you’re going to keep learning. And it doesn’t get more comfortable, you just get better at managing the discomfort. I still get uncomfortable, but it doesn’t cause me as much drama because I’ve done it over and over again so I’ve learned how to work through it. And it’ll just get better and better and better, and you’ll still have to do things in the future that get you uncomfortable. It’s your opportunity right now to learn how to manage it now so you can manage it at your next level. That is how you create massive momentum. If you want it in a simpler term, write down five things that you’re afraid of doing, that you know in your heart you want to do. It will feel very real, it will feel like you’re jumping off a cliff, and I want you to practice doing one of them over the next – one each week for the next five weeks and see what happens to your life and see what happens to your business. It will change everything. So now that we’re here, five episodes, Next Level Your Biz series is complete. I want to offer you one last chance to apply for the Next Level mastermind. I want to work with women who are ready to take those jumps but just know you’re not going to feel ready. It’s going to feel uncomfortable. But I want to work with people who are ready to scale to six figures and multiple six figures, who are ready to do this, who are ready to get over that hump of I don’t really feel like I even have enough time, I don’t have leverage, I’m feeling stuck in this, this, and this area. This is the program for you. This is the mastermind that is going to help you learn how to build the foundation and then execute doubling your business. So this is the decision – if this is one of the decisions for you that you know the next level you would for sure do, it’s something to look at here. This is something to even apply this work on. For some of you guys this might not be the right fit. Totally okay. But for those of you who feel this in your heart, look at what’s holding you back. If you knew you were going to get 10X, or you were going to five times your investment, would you do it? And what’s keeping you from trusting that you’re going to do that? That’s what’s actually getting in your way. So go to lindseymangocoaching.com/nextlevel to apply and then we can kind of open up the chat if you’re the right fit about your questions and about any coaching that you need, and I’m just so freaking excited to get started with the ladies who are joining. I’m so freaking excited that you guys are here and you went through this five -day experience. Don’t worry, the regular podcast series will be continuing on and I’m sure I’ll be dropping even more business knowledge and business expertise there and continue to give the mindset and the life and all of the things. So I just love you guys, I’m so excited you’re here and I will talk you next week. Bye.